Through 5/19; Thu-Sat 8 PM, Sun 3 PM, Chopin Theatre, 1543 W. Division, 773-769-3832, thehousetheatre.com, $30-$50, $20 students and industry (same-day purchase). With their adaptation of Carlo Collodi's Pinocchio, Joseph Steakley and Ben Lobpries have fashioned a fable about Trump-era nationalism. It's not subtle. At one point, a rabidly ignorant crowd condemns the titular wooden boy with percussive cries of "String him up!" His crime? 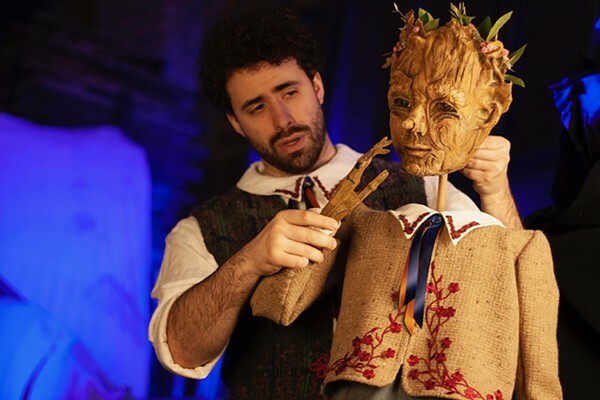 Pinocchio (created by the Chicago Puppet Studio and voiced and manipulated by Sean Garratt) doesn't come from town, he comes from the forest. And as the tiki-torch-wielding villagers loudly exclaim, nothing good comes from the forest. The Blue Fairy (Karissa Murrell Myers) explains: "They're human. They're afraid of anything they don't understand." Local twit-brained tyrant Doohickey (Kevin Stangler) harnesses that fear, demanding that the forest be burned down, never mind the impact on the environment. Bennett Fisher’s play has all the amenities except a well-explored point.